"I chose this design after thinking about it for a long time. It was my second tattoo, the largest I've had so far, and when I got it, it was the most visible. Because I knew it would be visible, I wanted it to be really special. The flowers are globe mallows, a desert flower. I grew up in Tucson and went camping all over the southwest. Mallows are my favorite flower from that area, and they range from orange to fuchsia The book is for my love of reading and writing, and I wrote the prayer that covers the open pages. My artist, Doc, was so wonderful that he managed to keep my handwriting from the sketch that I brought for him. The feather pen draws from the color of the parakeet on the other side. 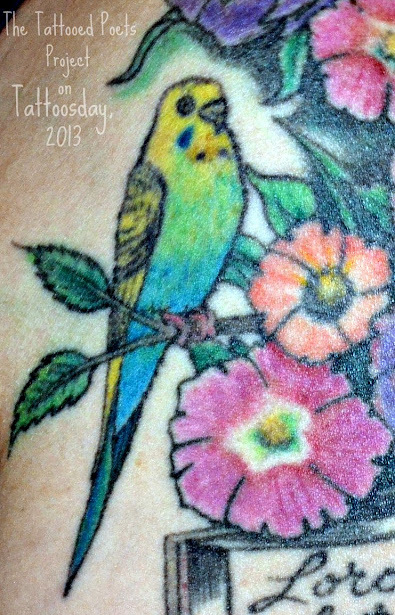 The parakeet wasn't part of the original plan, but after all the black was done, Doc mentioned that I had asked about including a bird and there was a perfect spot for her. I had a parakeet who was my best friend when I finally moved out on my own and started my adult life. She was with me for almost ten years and is still my little muse. But those branches she perches on now really hurt to have inked in! I had the tattoo done in Joliet, Illinois at Wolf's Fine Line Tattoo. by Doc. He's the best." of granite, sun-warmed, and crying every time it rains. Kristin LaTour has a chapbook, Agoraphobia, forthcoming from Dancing Girl Press, as well as two others: Blood (Naked Mannequin Press, 2009) and Town Limits (Pudding House Press, 2007). Her poetry has appeared in journals such as Fifth Wednesday, Cider Press Review, After Hours, dirtcakes, qarrstiluni, and The Adroit Journal. She teaches at Joliet Jr. College and lives in Aurora, IL with her writer husband and two dogitos. You can find more information at www.kristinlatour.com. 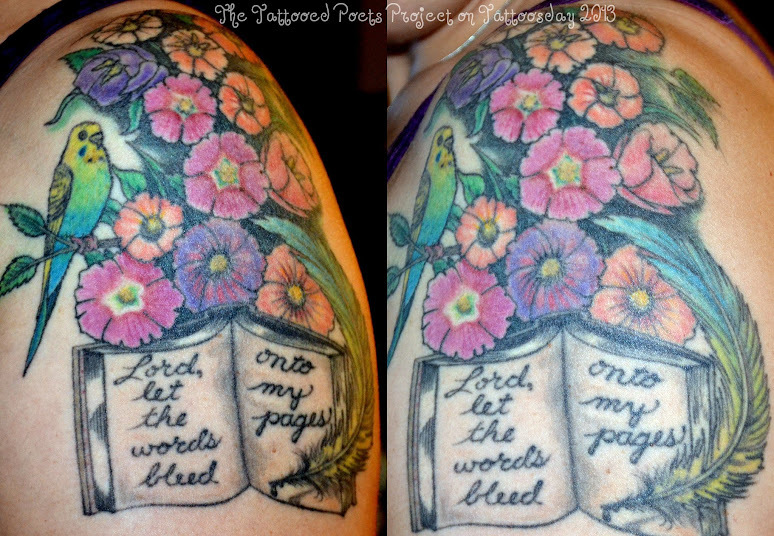 Thanks to Kristin for her contribution to Tattoosday and the Tattooed Poets Project! This entry is ©2013 Tattoosday. The poem and tattoos are reprinted with the poet's permission.